Copyright © 2013 Hidetaka Noritomi et al. This is an open access article distributed under the Creative Commons Attribu- tion License, which permits unrestricted use, distribution, and reproduction in any medium, provided the original work is properly cited. Silver nanoparticles were prepared in reverse micelles of alkyl glucosides by the injection method. The TEM image showed that the obtained silver nanoparticles displayed a wide variety of shapes. The size of silver nanoparticles was strongly dependent upon the kind of reducing agents, and tended to slightly increase with an increase in reaction temperature. The size of silver nanoparticles was hardly dependent upon the molar ratio of water to surfactant and the alkyl chain length of surfactants. Silver nanoparticles having various shapes were obtained at high concentration by the solid-liquid extraction method. The resultant silver colloid could be preserved for at least one month without precipitation. The applications of silver nanoparticles have widely been investigated, since they exhibit some profitable properties such as catalysis , antibacterial agent , nanoparticle colorant , nanopaste for printed electronics , and substrates for surface-enhanced Raman scattering . The colors of silver nanoparticles result from changes of LSPR induced by their size and shape. In order to produce metal nanoparticles, many physical or chemical techniques such as coprecipitation, gas- evaporation, sol-gel method, and sputtering have been developed so far . Additionally, more attention has been paid on the preparation of metal nanoparticles in reverse micelles . Reverse micelles are thermodynamically stable nanometer-sized aggregates of surfactant molecules dispersed in a hydrophobic organic phase like octane, and can form w/o type microemulsions containing a small amount of water in their centers. The preparation of nanoparticles using reverse micelles is a kind of build-up method, and does not require a special apparatus and extreme conditions of temperature and pressure. In order to synthesize silver nanoparticles in reverse micelles, ionic surfactants such as cetyltrimethylammonium bromide (CTAB) and sodium bis(2-ethylhexyl) sulfosuccinate (AOT) have mainly been used [8- 11]. However, those surfactants have several types of toxicity to aquatic organisms and pollute the environment [12,13]. In our previous work, we have reported that silver nanoparticles are prepared in reverse micelles of sucrose fatty acid esters by using the conventional injection method, and the production amount of silver nanoparticles per the reaction volume is drastically enhanced by the novel solid-liquid extraction method [14,15]. Sucrose fatty acid esters are commercial food grade nonionic surfactants, and are biodegradable and nonhazardous to the environment . In the present work, we examined the preparation of silver nanoparticles in reverse micelles of alkyl glucosides to address how the preparation conditions such as the molar ratio of water to surfactant, the kind of reducing agents, the reaction temperature, and the alkyl chain length of surfactants affect the size and shape of silver nanoparticles, since alkyl glucosides have biodegradability and biocompatibility and are widely used as a detergent for dishes and a shampoo. Silver nitrate, hydrazinium hydroxide, and sodium borohydride were the guaranteed reagents of Kanto Chemicals (Tokyo, Japan). As alkyl glucoside (AG), n-heptyl glucoside (AG7), n-octyl glucoside (AG8L), 2-ethylhexyl glucoside (AG8B), n-nonyl glucoside (AG9), ndecyl glucoside (AG10), n-undecyl glucoside (AG11), and n-dodecyl glucoside (AG12) were supplied from GUN EI Chemical Industry (Gunma, Japan). The hydrophilic group of AG consisted of monoglucoside (75%), diglucoside (20%), and triglucoside (5%). Figure 1 shows the structure of AG. The surfactant was used without further purification. Isooctane and n-butanol were from Kanto Chemicals (Tokyo, Japan), and were of analytical grade. The reverse micellar solutions containing reducing agent and AgNO3 were prepared by injecting the required amounts of the corresponding aqueous solution into the solution of n-butanol/isooctane (3:7 (v/v)) containing AG, and then were used for the preparation of nanoparticles within a few minutes. The preparation of nanoparticles was achieved by mixing equal volumes of two reverse micellar solutions at the same water concentration, one containing an aqueous solution of AgNO3 and the other containing an aqueous solution of hydrazine or sodium borohydride as a reducing agent. The preliminary study indicated that the synthesis of particles finished within 1 h. In order to evaluate the dispersion of resultant particles, the samples for various analyses were taken after 3 h. In the present work, the concentration of AG based on the overall volume of reverse micellar solution was fixed at 50 mM. As a typical condition, the concentrations of AgNO3 and hydrazine or sodium borohydride in the water pool of reverse micelles were 0.1 and 1.0 M, respectively, and the temperature was fixed at 25˚C. Figure 1. Structure of alkyl glucoside. adding a certain amounts of AgNO3 powder and sodium borohydride powder into the reverse micellar solution. Since the preliminary study indicated that the synthesis of particles finished at 25˚C after 3 h, and no residual solid reactants existed in the reaction medium, the samples for various analyses were taken after 3 h. In the present work, the concentrations of AG12 and water based on the overall volume of reverse micellar solution were fixed at 50 and 40 mM, respectively. As a typical condition, the overall concentrations of AgNO3 and sodium borohydride were 0.1 and 1.0 M, respectively, and the temperature was fixed at 25˚C. The TEM micrograph was obtained using a JEOL JEM-2000FX electron microscope operating at 200 kV. The sample for TEM was prepared by placing a drop of colloidal solution onto the standard carbon-coated copper grids and drying it under vacuum. The UV-vis spectra of the reverse micellar solutions containing nanoparticles were measured by UV/vis spectrophotometer (Ubest-55, Japan Spectroscopic Co. Ltd.) with a 10 mm quartz cell. We have previously reported that AG12 can form stable reverse micelles in AG12/n-butanol/isooctane system at 3.3 mM AG12 or more, and has the significant solubilization ability for water miscible dyes . In the present work, we have first examined the synthesis of silver nanoparticles in AG12 reverse micelles by the injection method. Figure 2 shows UV-visible absorption spectrum of silver nanoparticles after synthesis with hydrazine in AG12 reverse micelles for 3 h by the injection method. Figure 2. 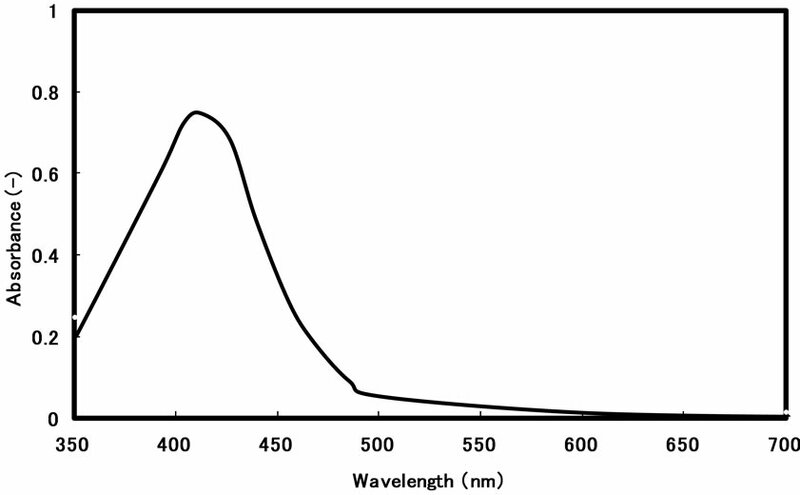 Absorption spectrum of silver nanoparticles prepared in AG12 reverse micelles by the injection method: [AgNO3]wp = 0.1 M; [N2H5OH]wp = 1.0 M; n-butanol/isooctane containing 50 mM AG12 and 250 mM H2O; reaction temperature = 25˚C; reaction time = 3 h.
The color of the solution after synthesis was yellow, and its UV-visible absorption spectrum exhibited the peak around 410 nm, which corresponds upon the LSPR of silver nanoparticles . The peak steeply increased with an increase in reaction time, and reached a plateau around 1 h. Furthermore, in order to assess the stability in the dispersion of resultant particles after their formation, the preparation of silver nanoparticles was carried out for 3 h in the present work. Figure 3 shows the typical transmission electron micrograph and size distribution of silver nanoparticles when silver nanoparticles were prepared with hydrazine in AG12 reverse micelles at 25˚C for 3 h by the injection method. The TEM image shows that the obtained silver nanoparticles display a wide variety of shapes with a mean diameter of 14 ± 3.7 nm. AG12 exhibited the sufficient solubilization and dispersion capabilities in the present system, since reactant solutions could spontaneously be solubilized into the organic solution containing AG12 and the generated silver nanoparticles were relatively stabilized at room temperature for at least one month, similar to the case of silver nanoparticles in reverse micelles of sucrose fatty acid esters . Figure 3. Transmission electron micrograph and particle size distribution of silver nanoparticles synthesized in AG12 reverse micelles by the injection method: [AgNO3]wp = 0.1 M; [N2H5OH]wp = 1.0 M; n-butanol/ isooctane containing 50 mM AG12 and 250 mM H2O; reaction temperature = 25˚C; reaction time = 3 h.
the Wo value. Figure 4 showed the plot of the mean diameters of silver nanoparticles prepared with hydrazine by the injection method against the Wo value in AG12 reverse micelles. 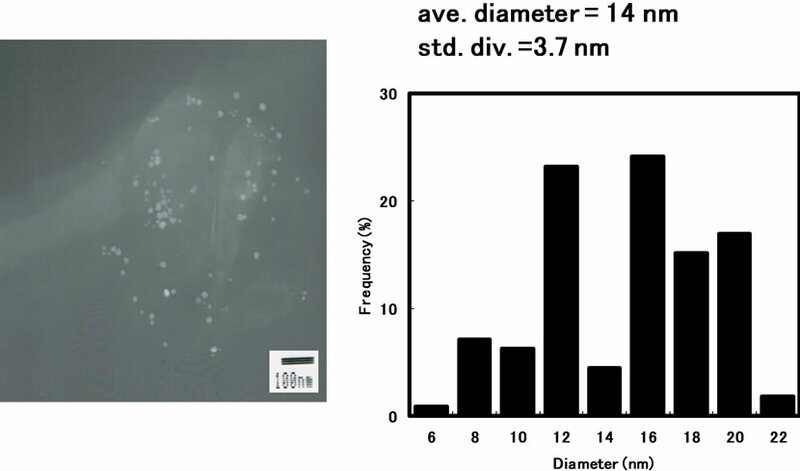 As shown in Figure 4, the size of silver nanoparticles hardly changed with the Wo value in the present system, similar to the case of silver nanoparticles in reverse micelles of sucrose fatty acid esters . On the other hand, the mean diameter of silver nanoparticles prepared with sodium borohydride showed 7.8 nm at Wo = 5, while the mean diameter of silver nanoparticles prepared with hydrazine showed 14 nm. The formation of nuclei is enhanced by using sodium borohydride compared to the case of hydrazine, since the reducing power of sodium borohydride is stronger than that of hydrazine . The more number of nuclei are formed, the smaller the size of nanoparticles becomes. Accordingly, the size of silver nanoparticles obtained in the sodium borohydride system is smaller than that in the hydrazine system. Figure 5 shows the plots of the mean diameter of silver nanoparticles prepared with hydrazine by the injection method against reaction temperature. As seen in the figure, the mean diameter of silver nanoparticles tended to slightly increase with an increase in reaction temperature. The solubilization of reactants, the exchange of reactants between reverse micelles, the reduction reaction, and the growth of nanoparticles increase with increasing the reaction temperature [10,22-24]. Figure 4. 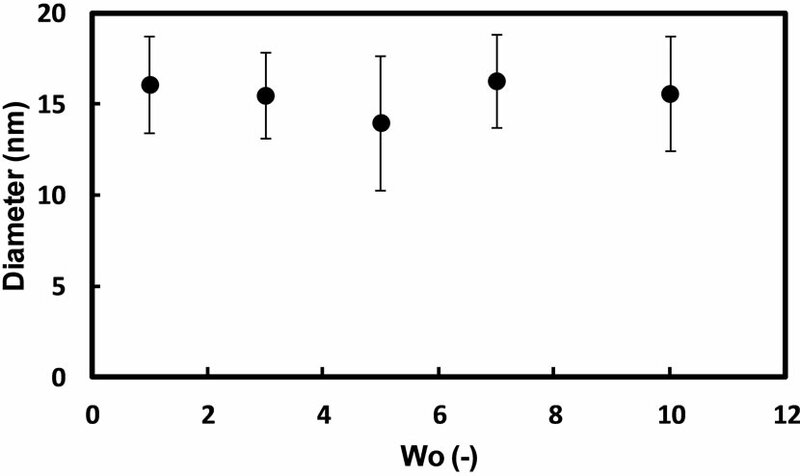 Effect of Wo value (the molar ratio of water to AG12) on the mean diameter of silver nanoparticles synthesized in AG12 reverse micelles by the injection method: [AgNO3]wp = 0.1 M; [N2H5OH]wp = 1.0 M; n-butanol/isooctane containing 50 mM AG12 and a certain amount of H2O; reaction temperature = 25˚C; reaction time = 3 h.
Figure 5. 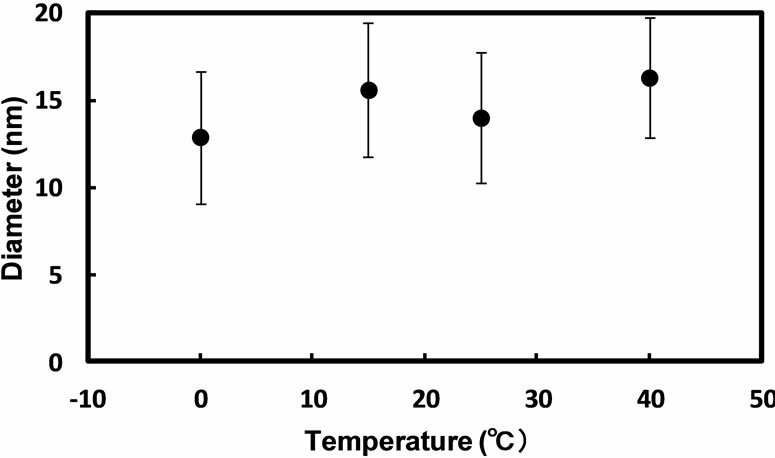 Effect of reaction temperature on the mean diameter of silver nanoparticles synthesized in AG12 reverse micelles by the injection method: [AgNO3]wp = 0.1 M; [N2H5OH]wp = 1.0 M; n-butanol/isooctane containing 50 mM AG12 and 250 mM H2O; reaction time = 3 h.
structure and/or HLB of surfactants [25-27]. We have reported that the sizes of silver and palladium nanoparticles prepared in reverse micelles of sucrose fatty acid esters strongly depend on the average esterification degree of surfactants forming reverse micelles [14,28]. In the present work, we have examined the synthesis of silver nanoparticles in the reverse micelles of AG having a different alkyl chain length. 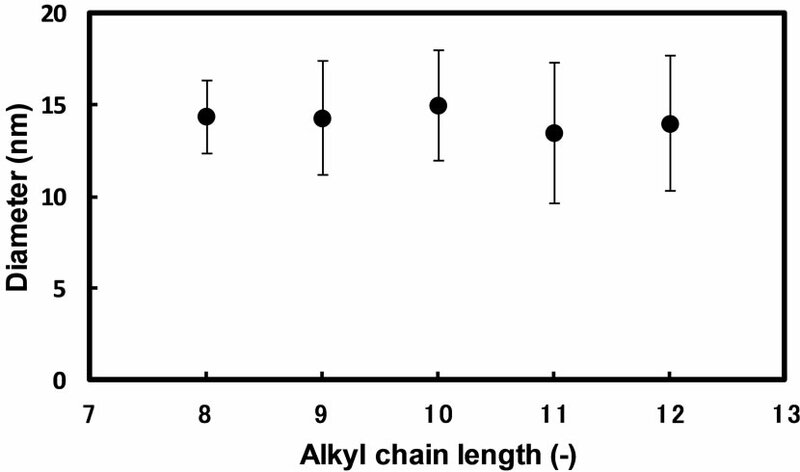 Figure 6 shows the relation between the alkyl chain length of AG and the diameter of silver nanoparticles when silver nanoparticles were prepared with hydrazine in the reverse micellar system of AG having a different alkyl chain length for 3 h by the injection method. The diameter of silver nanoparticles appears to be independent upon the alkyl chain length from 8 to 12. On the other hand, when the AG7 reverse micellar solution containing an aqueous solution of AgNO3 and the AG7 reverse micellar solution containing an aqueous solution of hydrazine were mixed, the formation of precipitate was immediately observed in the solution. This indicates that the dispersion efficiency of AG7 reverse micellar solution is not enough to spontaneously disperse silver nanoparticles formed in the solution. When AG8B was used, the formation of precipitate was observed after mixing the reactant solutions as well. It appeared that the hydrophobic group of AG8B was too bulky to disperse silver nanoparticles. From these results, it is suggested that the reverse micellar solution of AG having a linear alkyl chain at the alkyl chain length from 8 to 12 is suitable for preparing silver nanoparticles. Figure 6. Effect of alkyl chain length of surfactants on the mean diameter of silver nanoparticles synthesized in AG reverse micelles by the injection method: [AgNO3]wp = 0.1 M; [N2H5OH]wp = 1.0 M; n-butanol/isooctane containing 50 mM AG and 250 mM H2O; reaction temperature = 25˚C; reaction time = 3 h.
ticles per volume of reverse micellar system by the conventional injection method is limited due to low overall concentration of reactants in the reverse micellar system, since the volumetric ratio of water phase playing a role as the dissolution of reactants and the reaction field to the bulk organic phase is too small . We have previously found out that the synthesis of silver nanoparticles is drastically promoted in reverse micelles of sucrose fatty acid esters by supplying solid reactants to the water pool through solid-liquid extraction . The preparation of silver nanoparticles was examined in AG12 reverse micelles by the solid-liquid extraction method. The formation of silver nanoparticles was observed as seen in Figure 7. The colloidal solution of silver nanoparticles prepared by solid-liquid extraction method was much concentrated, compared to that prepared by the injection method mentioned above. The diameter of silver nanoparticles obtained by the solid-liquid extraction method was smaller than that obtained by the injection method. The resultant silver colloid could be preserved for at least one month without precipitation. Figure 7. 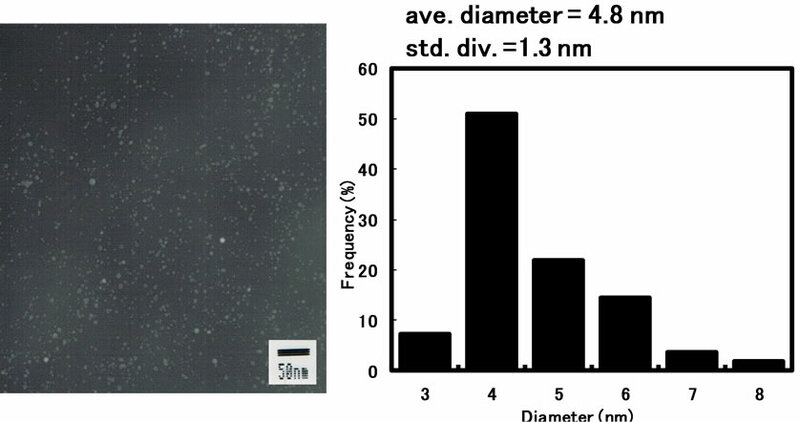 Transmission electron micrograph and particle size distribution of silver nanoparticles synthesized in AG12 reverse micelles by the solid-liquid extraction method: [AgNO3]ov = 0.1 M; [NaBH4]ov = 1.0 M; n-butanol/isooctane containing 50 mM AG12 and 40 mM H2O; reaction temperature = 25˚C; reaction time = 3 h.
by supplying reactants to the water pool through solidliquid extraction. Y. Okumura, “Organic Solvents and Surfactants for Toxicity Test Using Aquatic Organisms and Their Acceptable Concentrations,” Bulletin of the National Research Institute of Fisheries Science, Vol. 11, No. 11, 1998, pp. 113- 134. P. L. Luisi and B. E. Straub, “Reverse Micelles: Biological and Technological Relevance of Amphiphilic Structures in Apolar Media,” Plenum Press, New York, 1984. W. L. Hinze, “Organized Assemblies in Chemical Analysis Vol. 1: Reverse Micelles,” JAI Press Ltd., Greenwich, London, 1994. J. N. Israelachvili, “Intermolecular and Surface Forces,” Academic Press Ltd., London, 1985.